Enjoy flavor variety and 2 meals a day for a month! 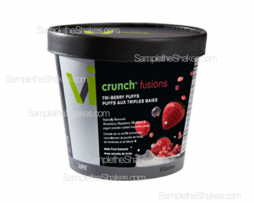 Enjoy delicious Vi Crunch™ Fusions Tri-Berry Puffs. With naturally flavoured Strawberry, Raspberry, Blueberry & yogurt powder coated rice puffs with Fruit Extracts. 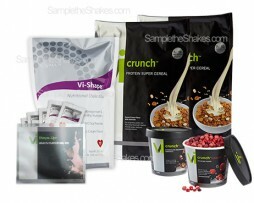 Sprinkle on your cereal, yogurt or add to your Vi-Shape® Shake for added flavour and crunch! Can also be enjoyed right out of the package as a delicious and nutritious snack! 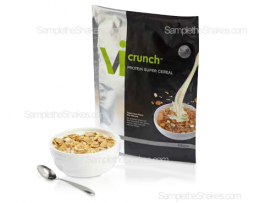 Add a burst of flavor, texture and nutrition to your breakfast or your favorite foods with Vi Crunch™ Fusions! 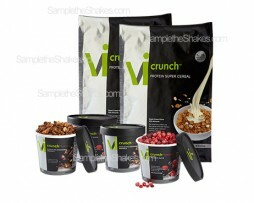 Sprinkle onto your cereal, yogurt or even your Vi-Shape® Shake to support your Body by Vi Challenge™ goals. Or enjoy them right out of the package as a nutritious and delicious snack. Available in two delightful flavors: Tri-Berry Puffs and Chocolate Macadamia Granola. LOVE THE SHAKE? CHEW ON THIS! Vi Crunch puts your Challenge goals in a bowl with the same amount of 12 grams of protein and 5 grams of prebiotic fiber that’s found in your Vi-Shape Shake! Combining our delicious Sweet Cream flavor with almond slices and added crunch, now you can chew your Challenge! 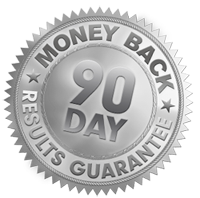 Vi Crunch combines our proprietary Fi-Sorb™ protein blend, an excellent source of fiber with prebiotics, and grape seed and rosemary antioxidants in a low fat, low sodium and no cholesterol formula that is healthy for you! Vi Crunch contains no artificial sweeteners, colors or preservatives, and is friendly for vegetarians as well as those watching their sugar intake. Everything you need… Nothing you don’t! 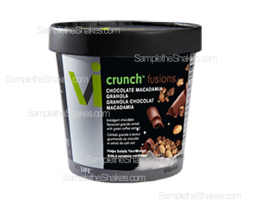 Enjoy delicious Vi Crunch™ Fusions Chocolate Macadamia Granola. With indulgent chocolate flavoured granola with real chocolate chunks and green coffee extract. Sprinkle on your cereal, yogurt or add to your Vi-Shape® Shake for added flavour and crunch! Can also be enjoyed right out of the package as a delicious and nutritious snack!